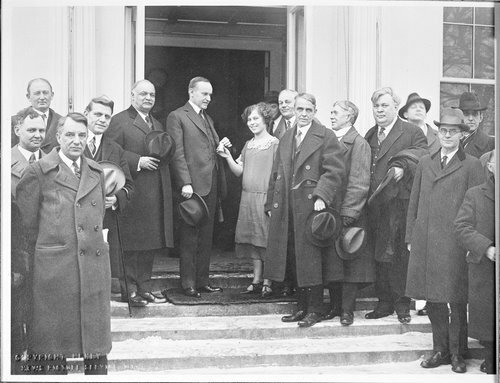 These two black and white photographs show Miss Kansas Wheat Girl Vada Watson Hoskinson, (1905-2000), presenting a bag of wheat to the thirtieth President of the United States Calvin Coolidge, in observance of Kansas' sixty-fourth anniversary of statehood, on the steps of the White House. To the left of President Coolidge is Kansas U.S. Senator Charles Curtis and to Vada's right is Kansas U.S. Senator Arthur Capper. Vada, a native of Turon, Kansas was selected in 1925 as the state's first wheat girl through a contest sponsored by Kansas State University. During her reign she traveled throughout the United States promoting the wholesome goodness of Kansas wheat.